For those following Mari of disparate disciplines, you might have seen the new release of her skirt pattern, the Summercrisp skirt. 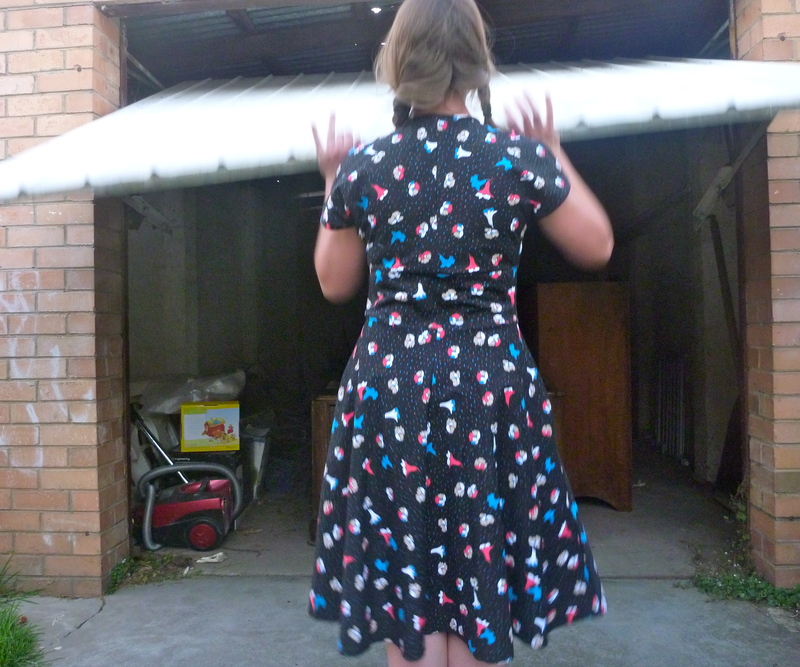 Lucky me was given the opportunity to pattern test the wrap skirt, and while I was quite sceptical about how much I would wear this skirt, it turns out to be very wearable (more in summer than winter for this version). Also, Mari does an amazing job on the tiling of the pdf pattern, so you only have to print out page ranges for your version. It’s SUPER convenient. The shaping of the pattern is quite clever with one side veering up interestingly, however it was a little shorter than I was expecting. Being at the side hasn’t limited it’s wearability as much as expected. The pattern could be quite simple, so of course I added crazy details, like lining it, using my snazzy rolled hem foot and generally making it from two of the most PITA fabrics of all time. They were stash gifts, and beautiful, soft and shifty. Therefore also really annoying to sew. While trying to photograph the skirt I was repeatedly photobombed, so hence all of the photos I’ve lifted the troublemaker out of the way. It’s becoming a recurring theme. Also, I realise I should have moved the bin – however it’s winter. Too bloody freezing to do anything but bolt out the back door, snap and move right back in. The top layer is a synthetic chiffon or something similar, it definitely a light summer blouse fabric, however being synthetic I was reluctant to use it for a blouse. I’ve still got a few yard left, so perhaps it’s too early to rule that out. It washed up lovely, and doesn’t tend to fray. The lining is a cream satin like fabric, which does tend to fray. *sigh*. After washing this skirt, I’ve got to go back and fix some of the lining where it has frayed a little, it doesn’t seem to like the washing machine. This pattern is suited to lightweight fabrics, and for summertime options I actually think a lightweight linen could be lovely. It’s really designed for knits, but as a beginner option I feel most beginner might shy away from using a knit. As mentioned above, the skirt was a little shorter than I expected at the sides, but it’s still totally wearable to the office. It swishes around beautifully and I haven’t found it flies up unexpectedly. As a beginner pattern, this really is one that has a bare minimum of techniques. If you sewed it with a lightweight cotton and pre-made bias tape, it really doesn’t get any easier. 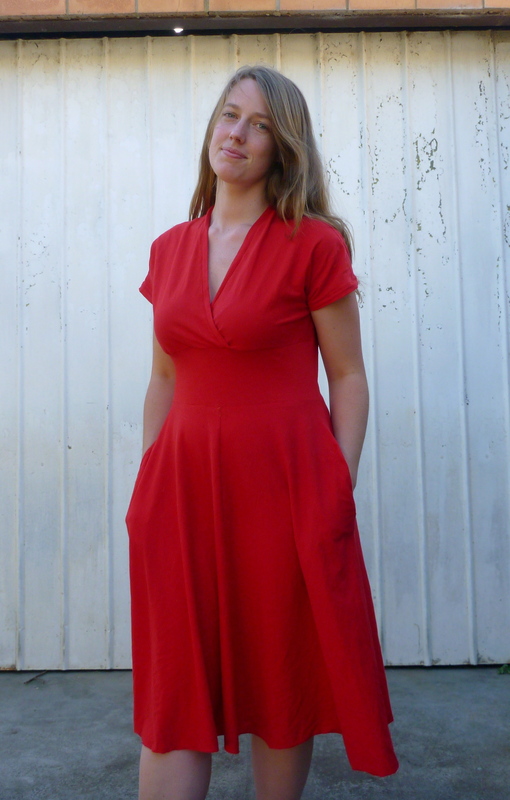 I sewed two, with linings and rolled hems and all sorts of craziness (bias bound seams on a wool version) and it was still a quick and simple make. While this is a great pattern for beginners, and I enjoyed making it and it looks lovely, it isn’t what jumps to my hand as I’m getting dressed in the morning. 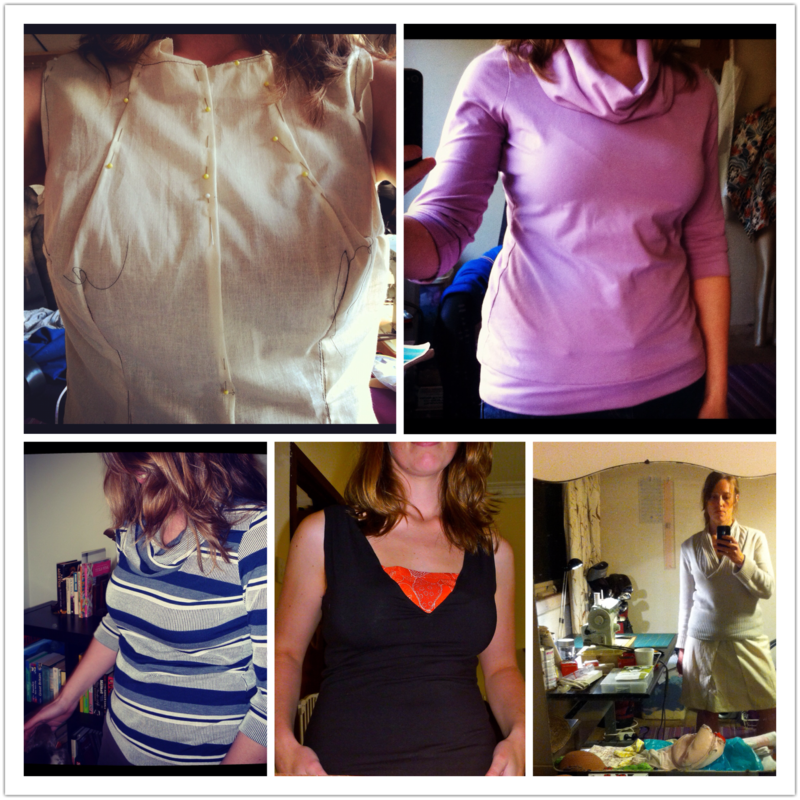 I’ve got to stop sewing so much summer clothing! As the weather warms up I think it will get much more use, however I really didn’t think about this version, the colours and “layerability”. It looks a little funny with black tights and boots, and so while very comfortable and wearable, it’s also going to be shelved until the spring. Also, rolled hems are SUPER EASY with a rolled hem foot. 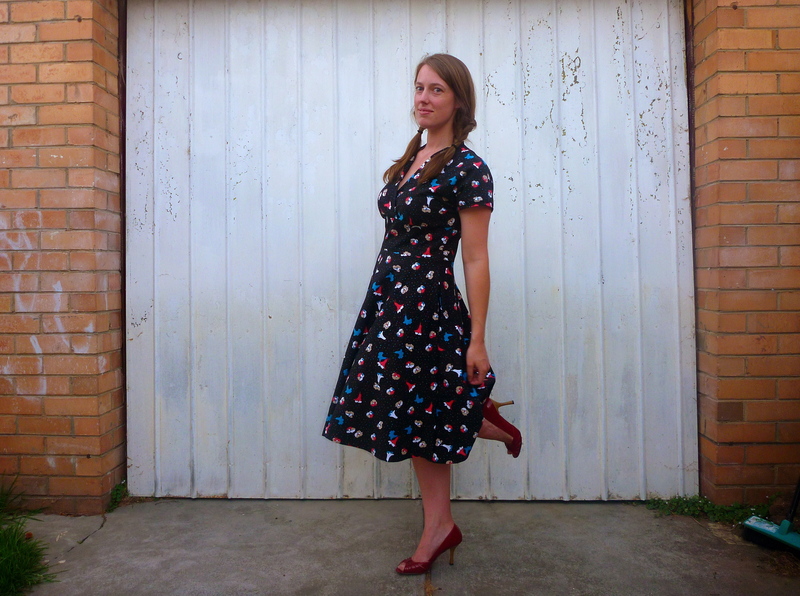 Why did I not order my sewing machine foot before the sewcietea dress? WHY?????? To save time, I cut out 4 of the pattern at once, two in blue and two in pink dots, using up 6 yards of flannel fabric from fabric.com. It was quite the little construction line, (and I was feeling considerably smug), until the flannel bested the serger. The poor serger has possibly never seen such a workout before, and in the face of innumerable tiny little seams the blades dulled and the timing disappeared. It would not sew. When finally the serger did return, I played around with a few waistband options, with having the threaded through elastic casing, a stitched down elastic (using fehr trade’s method), and even doing encased elastic at the back, with ribbon ties at the front. This is probably the best method for adjustability, but technically difficult to execute a bow on a tired wiggly toddler. My biggest problem now is my daughter LOVES these pj’s, and in the morning wraps her arms around herself so I can’t take her pj top off. 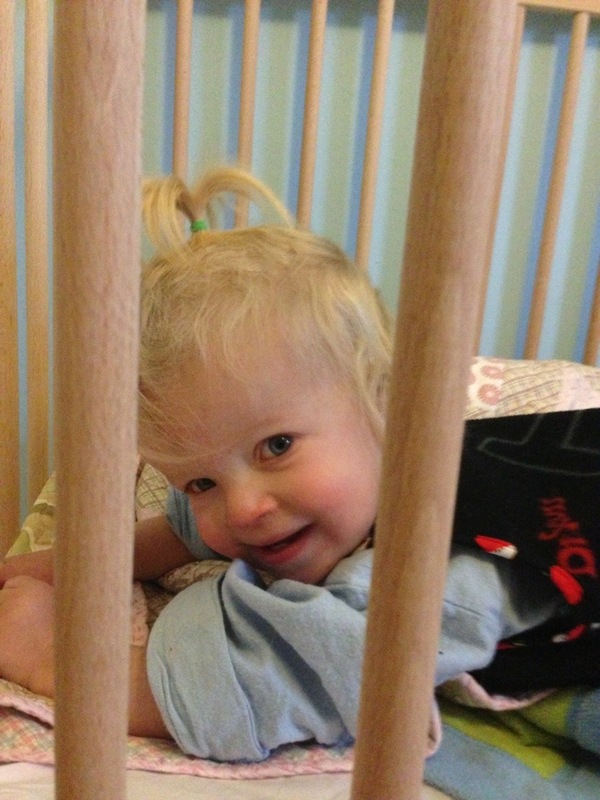 The levels of subterfuge, bribery and drama to get her dressed in the morning….. Sorry for the model and the blurriness, she just wouldn’t sit still, or smile, or generally co-operate. Look on the bright side, you just have to be frustrated by a picture of the model. 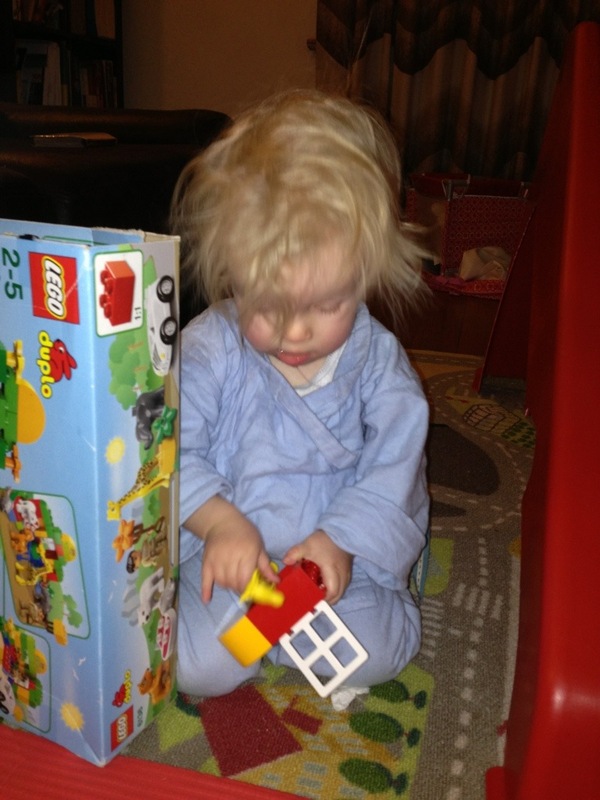 I’ve got to deal with trying to convince this crazy haired monster to eat. So while I’ve been a bit MIA, it’s due to being busy sewing! (and pretty much ALL unselfish sewing). After loving my first Tiramisu, I quick smart ordered some organic red cotton jersey from fabric.com (which incidentally arrived the same week). It was beautiful and slinky, and delicious to cuddle. This was an absolute pain in the arse to sew. The weight of the skirt meant I altered the bodice front 4 times, and I need to go back and raise the back band of the waistband, as it’s significantly dropped. Using the equivalent of steam a seam (which is fantastic) was the only way to make this dress, but the other problem? If you went within 2 foot of this jersey with an iron it would mark. Luckily, and the how or why of this is beyond me, after washing there were no iron marks. It looked seriously burnt before. Gah. Thank god this pattern is worth it. 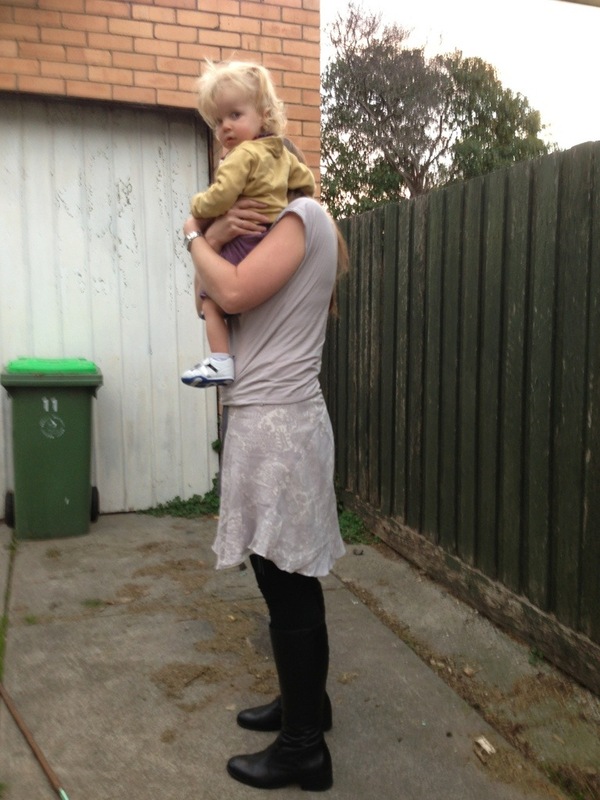 It’s well designed, the dress is lovely, and the way you choose your size is positively inspired. At the recent Social Shopping day, there was three Tira’s (one striped, one solid, one print) worn by Belle, Kirsty, and myself and it was decreed to be super dooper comfortable, although more suited to stable knits. 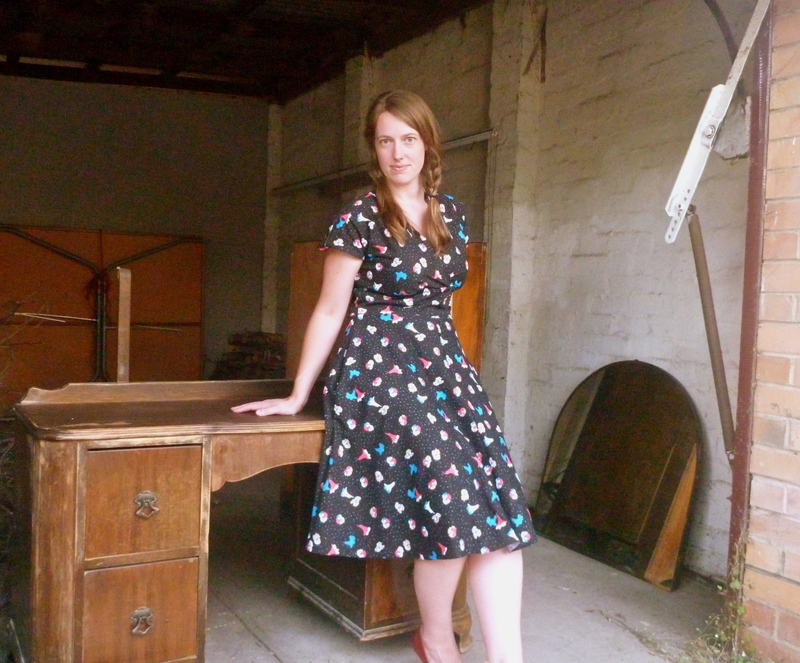 Incidentally, if you go to MyMessings blog, you can see us all in action shopping, and I love this photo as it’s totally pick the out the sewing patterns we’ve all used! If you weren’t aware that knits have stability, the general guideline is the more you swear while you sew it, the more unstable it is. You know what also doesn’t help? Forgetting to change your sewing machine needle, and using a sharp heavy weight needle. Oh my, did that punch big holes in the fabric. While this was more frustrating to sew compared to my first Tiramisu, this version is terribly comfortable. It’s my go to around the house and out and about dress, as I slip it on and forget I’m even wearing it. I still love the Tiramisu pattern, and would recommend it to anyone, especially beginners with knits, however if you are a beginner do go for the more stable knits, and check out sewing cake for hints and tips, and even to follow the tiramisu sewalong. 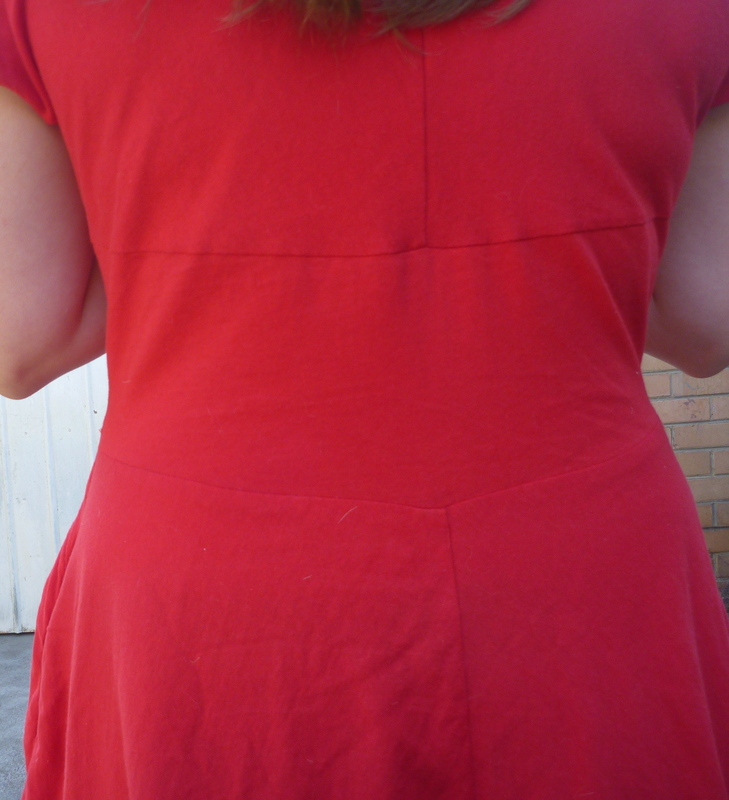 In the above photo, even though I’m not standing straight (so the CB seam looks off), you can see how the whole back looks like it has stretched down. The lightweight cotton means in the fit check, I cut off at least two inches off the front of the bodice, and I need to do the same for the back, but perhaps only a inch. 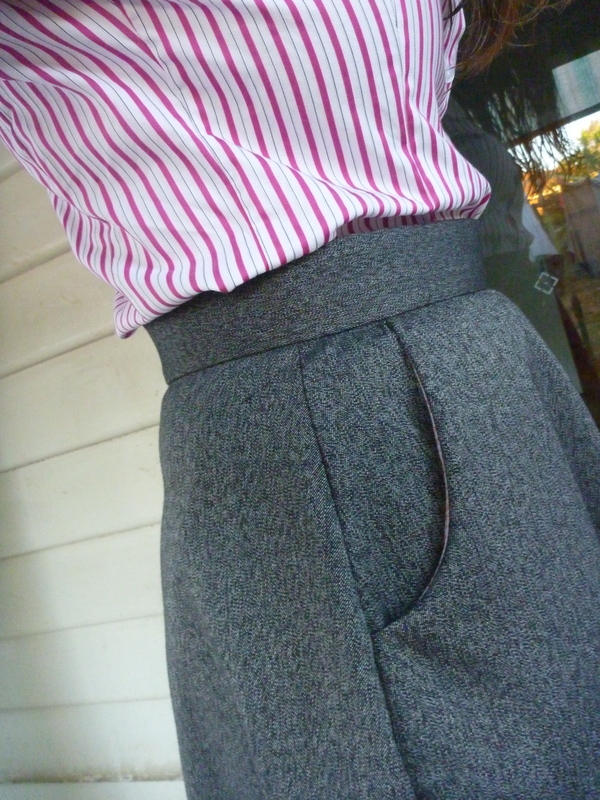 Without raising the back of the waistband, the shoulder seam is pulled forward towards the bodice. The pockets also pull on the dress and stretch, which means my iphone is too heavy for the pockets, however snotty baby tissues are fine, and considering that’s the usual contents of my pockets it still works ok for me. Pre-baby though, on such a lightweight jersey I would skip the pockets. This was an organic cotton jersey from fabric.com, which cost USD$7.98 per yard. The cotton is lightweight enough to wear on a 37 degree day, even with the length and skin coverage. My overlocked at the outermost setting still was stretching any seams on this cotton, and I had to use steam a seam fusible tape on everything. The big plus for this fabric is that even though it’s lightweight, it doesn’t stick to every lump and bump along the way, which is also a factor of the well designed pattern. For the cutting out of the Tiramisu I used a rotary cutter and self healing mat, as it is the easiest way to maintain the grain and not have the fabric slipping. For pattern weights I alternated between canned tuna and canned kidney beans depending on the size of the pattern piece. I snipped all pattern markings with my scissors. Every seam ended up being stabilised with the birch haberdashery equivalent of steam a seam. Which is seriously the only way to sew slinky knits. The seams were mostly just overlocked, and then a single line of topstitching done with my sewing machine (eventually) with a light ballpoint needle. I haven’t bothered hemming the dress, it doesn’t really need it and I’m lazy. WIN. The biggest problem I have at the moment (which is actually a really small problem to have in your life) is how to remember what needle is in my machine. I end up throwing out needles all the time as I have NO IDEA WHAT IT IS. It’s getting to the point where I either need to never leave a needle in my machine, or ask everyone else how they remember……. Hooray for a sewalong! Rachel at Mymessings is hosting a fabulous hollyburn sewalong, and as I need more work skirts, why not join in? 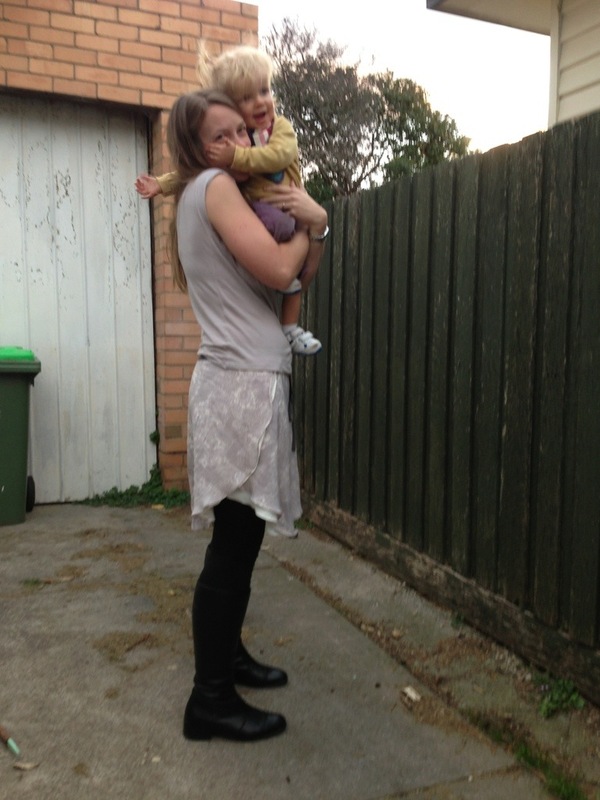 Some fabulous pale blue eyelet was sitting at the op shop for a mere $4, and was just crying out to be a pretty new skirt. And then the ghosts of poor seamstresses threw all my plans into disarray. While untangling the eyelet to pre-wash it, it turns out someone had already cut this eyelet into strips, with the cuts going across the grain and each piece only 25″ narrow. So narrow. Too narrow for a hollyburn. WHO WOULD DO THIS? Woefully I dried it and packed it away into the stash. There was no other hollyburn fabric in my stash (at least for a work skirt), so most tragically, I had to go fabric shopping. Nipping into GJ’s fabrics in Brunswick yielded fantastic results, with two “wool blends” on the remnant table seeking a good home. With kindness in my heart I adopted these blends for $27 for 4.5 metres. Someone had to do it. You know the really awesome thing? Out of the 2.5m drapey soft wool blend fabric, I’ve managed to cut one hollyburn and two jenny skirts. Ace right? 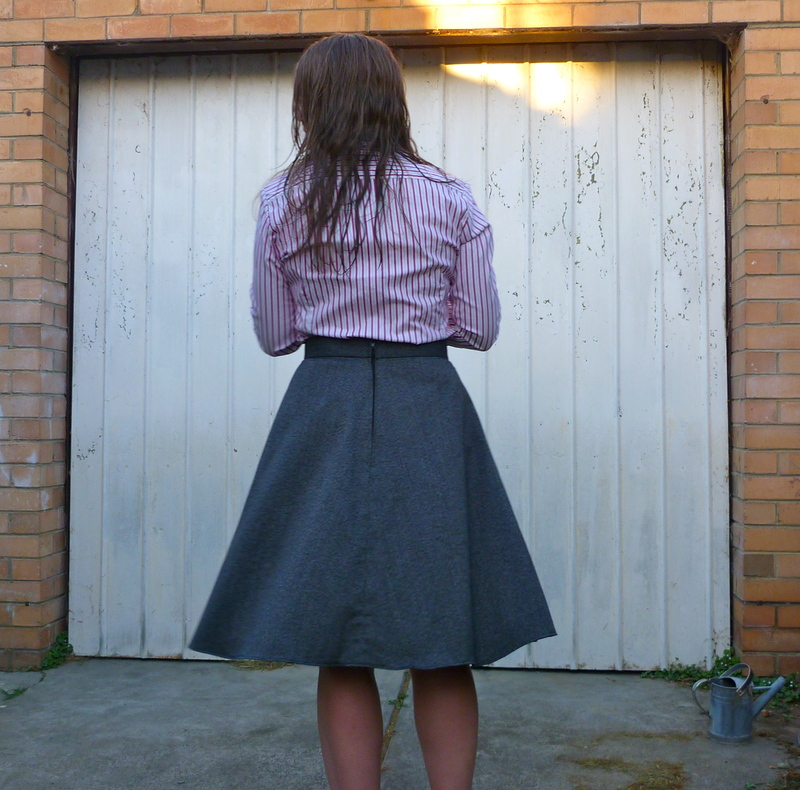 This skirt is easy to fit due to the style, and only the waistband is fitted. It’s firm around the waist, and then skims over the hips. I should have followed Rachel’s advice and maybe measured after a big meal, this is going to be a little tight if a pasta comes my way! 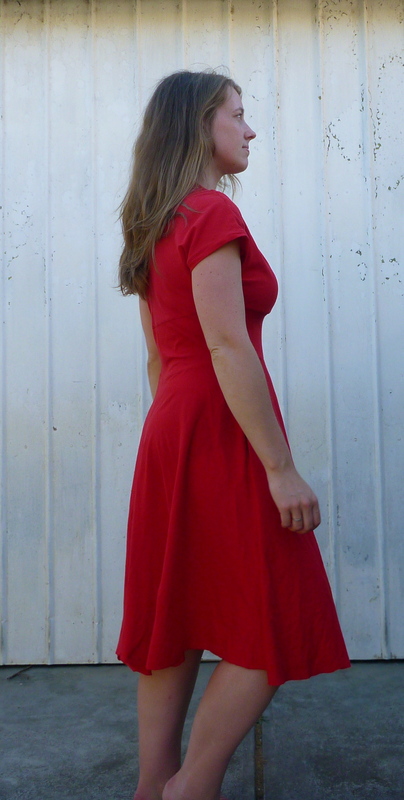 The pockets are the same style as the Cambie dress, so if you liked those, the hollyburn is a great skirt. For this version I’ve gone for a unlined option, but I would consider next time make a fully lined hollyburn. I cut view B, which was the mid-length option, which was a little long. I realise there is a shorter length, but that had to much ‘flounce’ for my work (and gust of wind risk) for my purposes. I’m close to the height sewaholic patterns are designed for, but I have a long torso and short legs. Don’t be too jealous now. All the skirts I’ve had to knock about 2″ off the hem, so this is going to become my standard sewaholic pattern adjustment. I have no idea what is blended with this wool, but it’s lovely and soft and likes to disintegrate when you sew it. I finished the seams with a line of stitching and then pinked the seam allowances, but you already can’t tell that I used pinking shears. This skirt may fall apart while I wear it, but we’ll worry about that later right? Perhaps some fraycheck might solve this problem. As one hollyburn and two jenny skirts were cut from 2.5m, a few concessions had to be made. 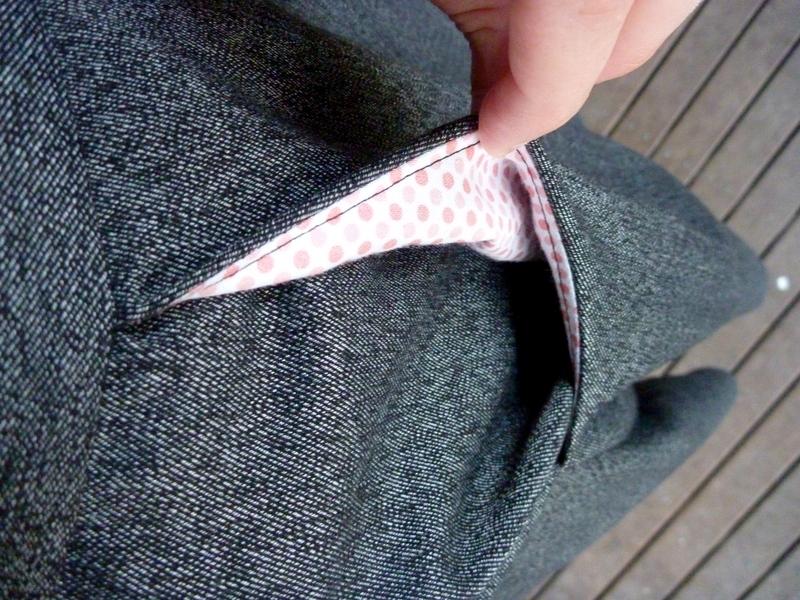 Like the lining of the pocket. 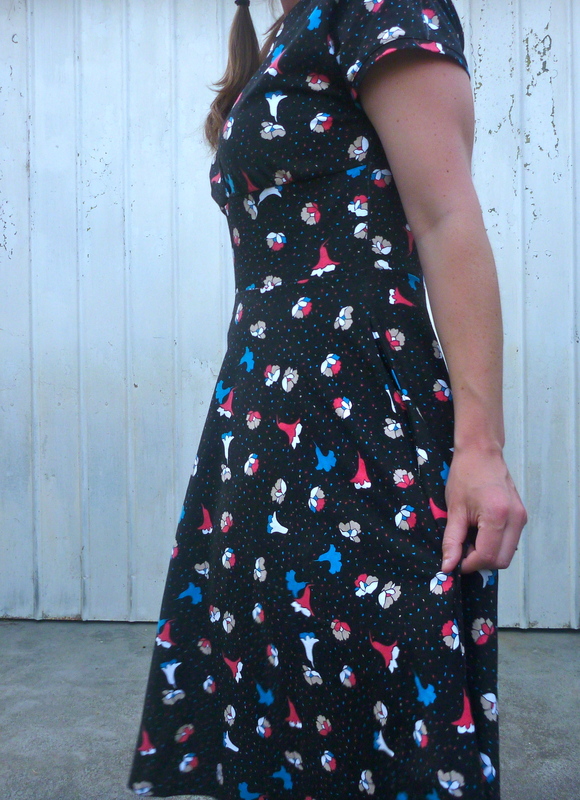 I did commit to making my clothes with whimsy! The pocket linings are from a fat quarter of fabric, which was $2 also from GJ’s discount fabrics. The pale pink spots that no-one can see, are my way of resistance like this skirt isn’t totally corporate and the man can’t keep me down. Yeah, I’ll look professional, but BAM. I HAVE CRAZY POCKETS. This is the perfect beginners skirt. Four panels and a waistband, and between Tasia’s very straightforward instructions and Rachel’s comprehensive sewalong posts you really couldn’t go wrong. If you’re considering learning to sew, although this has a zip in it, you can totally nail it. This skirt really reinforced something for me, it’s faster to hand baste than sew and then rip out a seam. I hand basted the waistband and then stitched in the ditch along the waist band, as this skirt is to be thrown in the washing machine in a rough fashion. I don’t love this skirt just because it’s a tad boring, however boring is the go-to for work clothes, After wearing this skirt all day, it drapes and moves in a very flattering way, and there really isn’t much to be done for that. The details make it more fun for me, but I’d like to have another go at the hollyburn and use colour blocking. Does anyone have suggestions of how to make boring clothes more interesting? I’m thinking solid colours but crazy design details. Or will I be veering away from ‘classic’ pieces and into the territory of disposable fashion? This is my complete Cake Patterns Tiramisu dress, with a knit print, just in case you haven’t seen enough Tira’s on the internet. Honestly, this pattern and I got off to a terrible start, and it’s remarkable how much my opinion of it has changed. So remarkable that here I am, remarking away for all to read on the interwebs. Initially the style and comfort of this design appealed to me, and when Steph offered the pre-sale to launch Cake Patterns, I immediately ordered my pattern. On arrival, it came with a correction sheet (which was communicated to the buyer prior). The corrections, which incidentally have all been fixed very tiny, totally understandable but just slightly put me off. If there were these mistakes, would any more appear in the pattern/instructions as people started making them? Would I get halfway through and discover there was a crucial bit of info missing that meant I would have ruined my version? It didn’t deter me, so I laid out my grey fabric, laid out my pattern pieces, and THEN had an epiphany . This grey fabric (now my Kimono top), would look awful as a dress. It was then I lost enthusiasm. Pale knits felt boring. The pattern errors grew larger in my mind. Lots of stripey versions appeared. 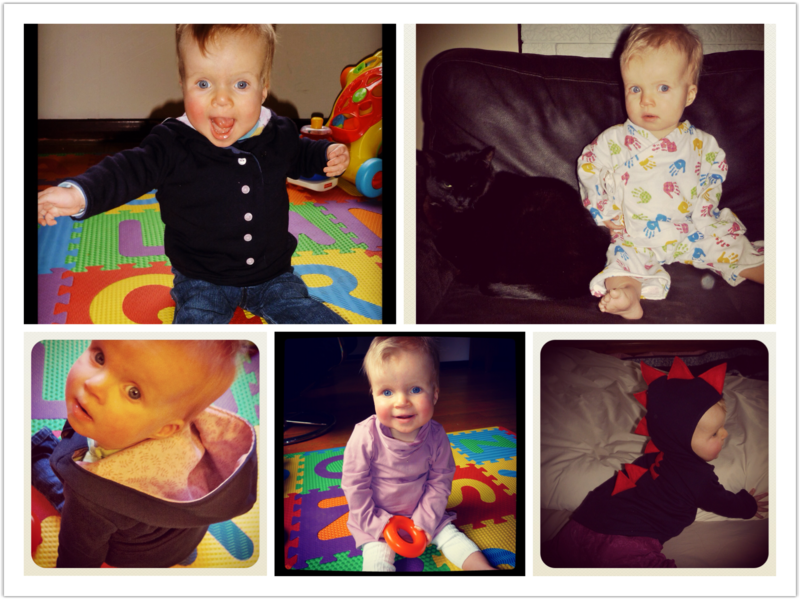 I didn’t want to wear stripes, or solid colours, or some kind of space age synthetic to get a print going. This tira, if it was ever going to happen needed to be BOLD. After much whining on twitter, I was planning on making a tessuti purchase of some boiled wool, and kind of threw this knit fabric in the basket. Luuuucky for that. 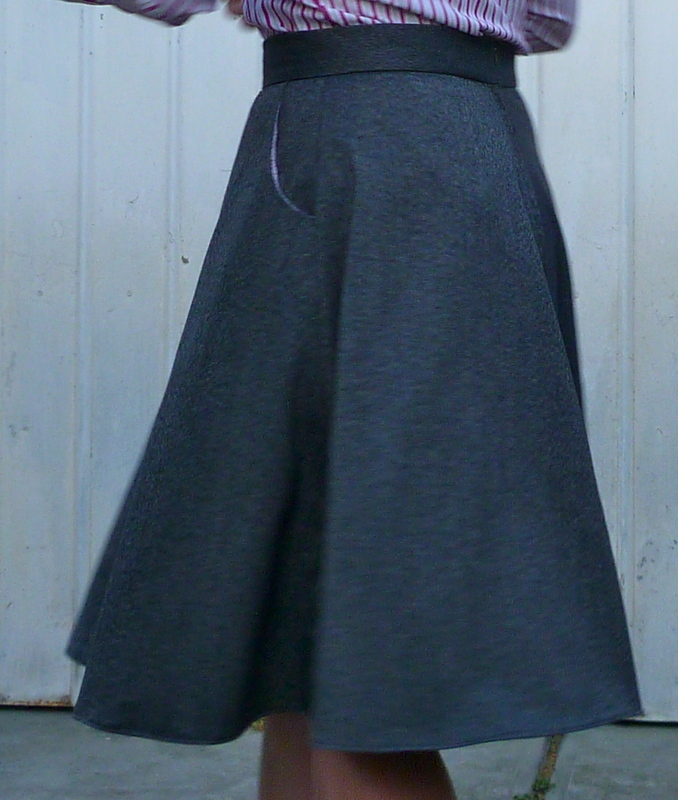 This ‘action’ shot shows how the tiramisu skirt drapes. It also shows my garage door needs to be fixed. 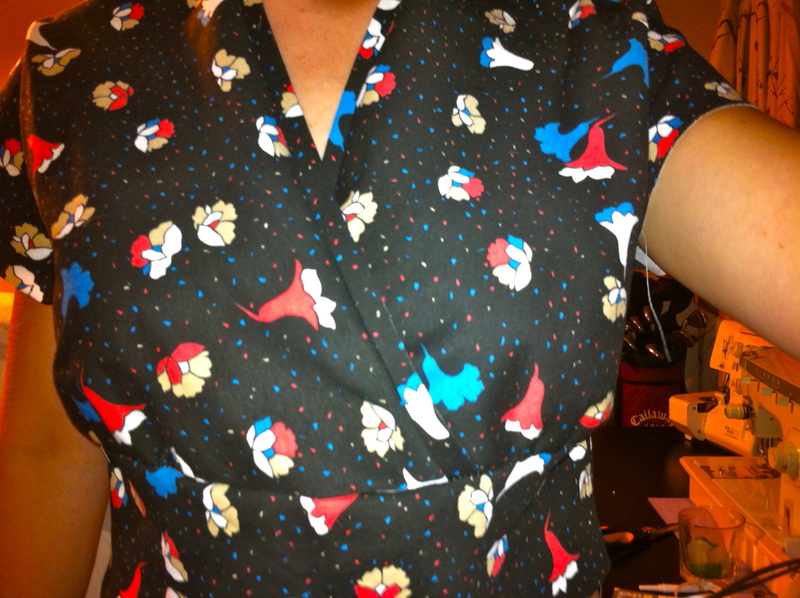 On wearing this to work, I cracked a total of 6 unsolicited compliments on my dress. That has Never Happened. Sewing my own wardrobe is actually making me unshabby myself. The fit has to be my favourite part of this pattern. The way Cake Patterns marks up it’s patterns to sizing is based on your measurement at different points of your body, not one specific size. On the bodice, separate cup sizes are marked, and the waistband expects you to vary your size. It basically incorporates grading between sizes in an easy way, and all the changes are made on each corresponding pattern piece already. I think I cut a 35D in the bodice, went down to a 27.5 waist for a tighter fit. There has been a bit of commentary about how loose fitting it can be, so like mentioned on the Cake patterns website, if you like a tighter fit and you are between measurements, go to the smaller size measurement. On doing the fit check, I ended up slicing about 2″ off the bottom of the bodice sides and it took 3 bouts of unpicking to be satisfying. As the sides are sewn up last, it made adjusting the tightness very easy, and with taking each side in between 1/2″ and 1″ it’s still a nice relaxed fit, but figure flattering. The only change I would make of my own would be the pockets, they can drape to the back, so I’m considering extending them to the waistband, but keeping the pocket in the same place. Idk exactly what it will look like, I’m going to put it on the mental backburner as the last thing I want to do is interfere with the drape of the skirt. Printed colours on knits often splits as the fabric stretches, so if you’re going to give this type of printed knit a try, better make it good quality. This is a printed cotton knit from Tessuti (purchased online here) with the most awesome name of Raining Petals. After making this, I’m such a convert to using fusible interfacing for knit fabrics. Never again a wavy hem…The only mishap was sewing late at night and putting fusible interfacing on the wrong side of my skirt. Boooo. This was whipped up on my serger, but would easily be sewn on a normal machine with a little practice if you’re new to knits. A little testing to get the thread tension right and it was very, very fast. I did do all the basting for the fit check steps on my sewing machine, as the serger is a little too permanent. Sewalongs are fun. I kinda was half following the 30 minute a day sewalong, and it was so much easier to break it into tiny little chunks of sewing. I might try and do tiny little chunks more often, as the naps around here are getting too short for big sew sessions. 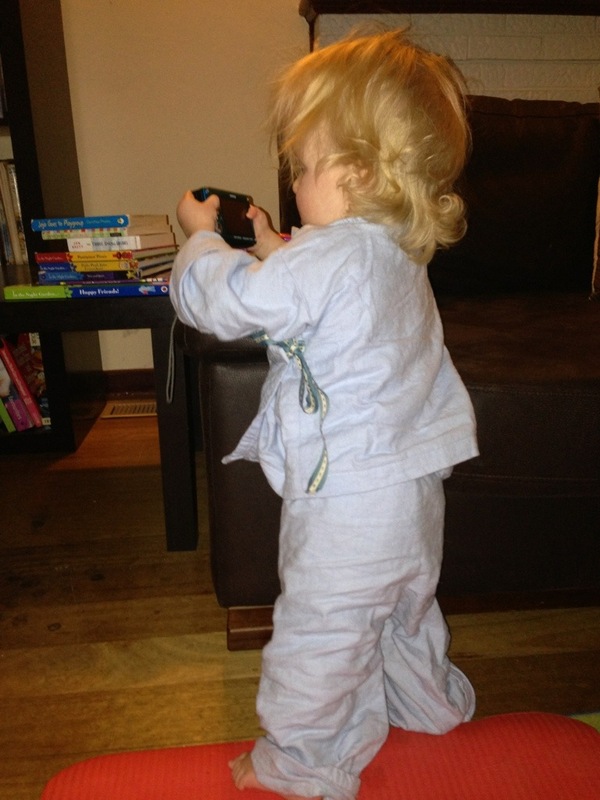 All and all, despite my initial misgivings this is a really fun, simple to sew dress. It’s thoughtfully designed, the instructions are very clear, and it’s a damn practical and flattering dress. While the next pattern to be released (Pavlova) isn’t my usual style, it looks like it will find it’s way to my cutting table regardless. I might try fitting my dresses in a similar way to the Tiramisu again, with trimming in the side seams as the last step, as it really was SO easy to get a nice fit. Now, excuse me, I’ve got Tira number 2 to sew. Seriously guys, do you read patterns on the train? Now I’m thinking I’m a little odd. After so many successful Renfrews, I was bitterly disappointed with this one, a mixed ponte. It possibly was doomed from the start, and I never wanted to admit it. The fabric was a last minute grab from the Remnants table at Tessuti. It’s a beautiful ponte, and very much a stable knit. So stable that it doesn’t stretch and give like I need it to. The Renfrew pattern is fine for larger busts with grading, but I found this was so stable I needed to have done a FBA so it would sit properly around the armscye. The purple had a fault running down the grain, which I didn’t notice but until after I greedily cut out my pattern, and the fault ran through both sleeves and the waistband. What to do? Mix up the colours of course *slaps head*. This would have worked better if the neck line was also in black. But it’s not. Because I bought just enough black ponte to eek out sleeves and a waistband, and did not have enough for the neckline. I also lengthened the waist, which works with a more stretchy knit, but this just shows that a swayback adjustment is probably in order. Especially with the back lengthened to cover le bum. Now what to do with it? It’s my most expensive Renfrew made, and I detest it. So far I’ve come up with two ideas, one being to cut it up and try and salvage the fabric for something for the baby, and the other idea is to try and fix it somehow? The mixed colours work when I lift my arms like a raglan top. Maybe if I trim out the excess around the tummy a little it might be ok? 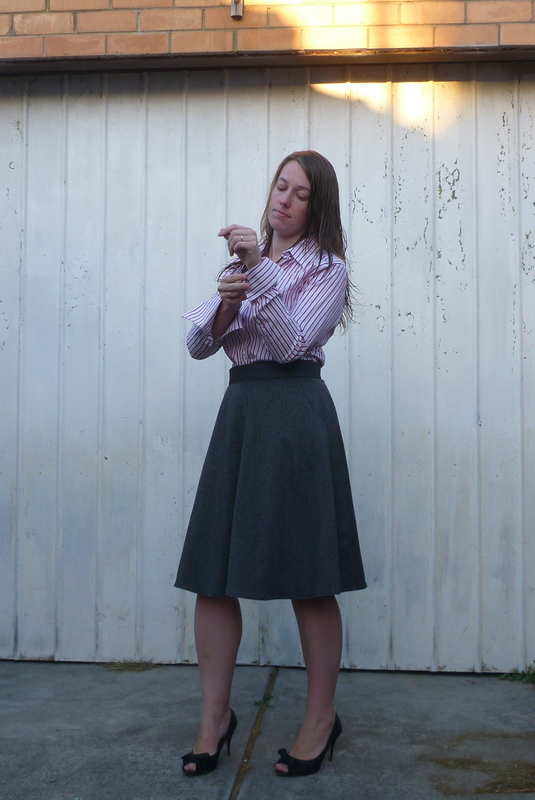 OR….could I trim it at the waist and add a black skirt? What do you think?